President Trump really wants to slash the corporate income tax rate to 15%. That would be a pretty huge drop from the current 35% rate. His argument: U.S. competitors all have lower corporate tax rates than we do. In many cases, much lower. Trump is right. The United States has the highest corporate rate among developed economies. 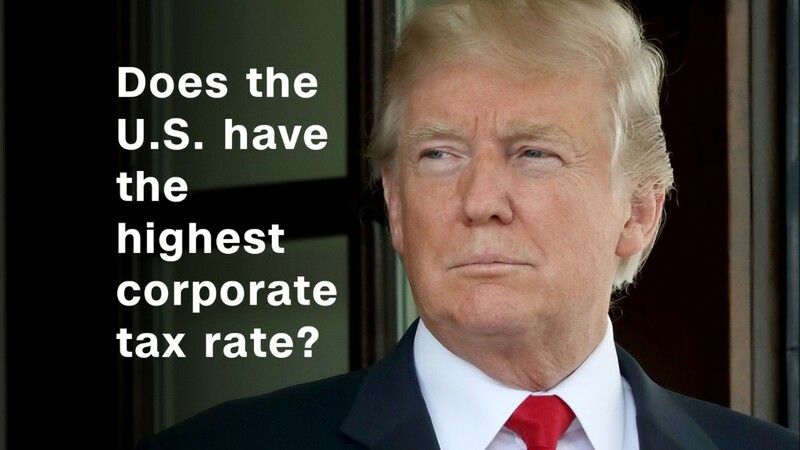 So the more lawmakers can lower the corporate rate, the more attractive the United States will be as a place for companies to do business. But there's one thing proponents of this argument don't mention: U.S. competitors impose a consumption tax in addition to their income and social insurance taxes. And that additional source of revenue helps offset the cost of their lower corporate rates. A consumption tax -- known as a value-added tax (VAT) or a goods and services tax (GST) -- generally ends up raising prices on consumer goods and is rarely popular. But it can bring in a lot of money. "Other countries can afford lower corporate rates because even a small increase in their VAT rate can pay for a large corporate rate cut," said Martin Sullivan, chief economist at Tax Analysts. VAT rates among members of the OECD, for example, range from as low as 5% to as high as 27%. The group's average -- 19.2% -- is at a record high. And the mix of revenue in member countries has shifted further toward labor and consumption taxes in recent years, according to the OECD. In the United States, of course, the perpetual stumbling block to any seriously large tax cut is how to pay for the lost revenue that will result. For example, lowering the corporate rate from 35% today to Trump's preferred 15% would cost about $2 trillion over a decade. Even lowering it to 23% -- which is close to what House Speaker Paul Ryan has said the goal would be -- would still cost $1.2 trillion. The options to pay for the rate cut include eliminating business tax breaks and praying for outsized economic growth. Another option is to simply not pay for some or all of the potential revenue loss, instead adding it to the cost of the nation's already large and growing debt. Other countries with a consumption tax have more choices. Yes, they may choose to curb tax breaks to pay for a business rate cut. But they also have the option of bumping up their VAT or GST to help make up for the revenue loss. In recent years, for example, the United Kingdom and Japan increased their VAT rates around the same time they cut their corporate rates. And if a corporate rate cut delivers some of the economic growth advocates promise, that in turn can boost revenue from a VAT even if the rate on the VAT stays the same. But to date there has been little appetite for a consumption tax in the United States. "Our national VAT-phobia precludes this possibility in the U.S.," Sullivan said. Just this summer, a House Republican proposal for a border adjustment tax, which is similar to a partial VAT, was shot down in large part because critics warned it would raise prices on imported consumer goods.